Quantitative Easing, or the stimulation of the economy by the injection of capital by one means or another, becomes necessary when that other tool of central banks in their efforts to maintain economic growth and stability, the interest rate, is exhausted. This happens when the rate reaches what economist call the “Lower Bound” of zero. Japan had this situation over the past decades, even when it was regarded as unthinkable in the West. Well, the unthinkable happened, of course, and US interest rates have been at the lower bound, to all intents and purposes, for some time. So enter Quantitative Easing. Now, for many commentators, QE is a totally unnatural, artificial, even downright dodgy strategy which, from their perspective, must end as quickly as possible. Economic growth, they might argue, is now in prospect again anyway, just look at the equity indexes – the S & P and the Dow are going through the roof. The problem is that stock prices are not a measure of economic wellbeing. The only valid measure of the health of any economy is the employment figures. 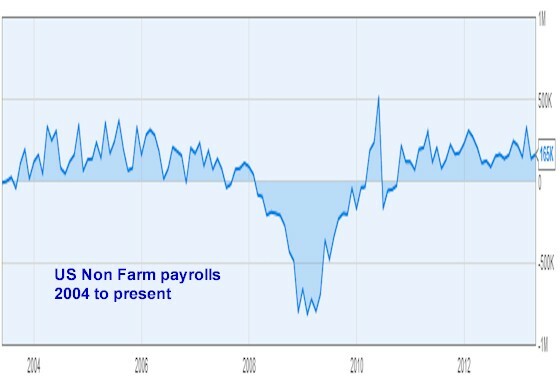 The yardstick for this in the US is the monthly Non Farm Payrolls report produced by the Bureau of Labor Statistics. Not only is it watched by economic policy makers, it is also used as a stick with which to beat the government of the day if it is falling, and therefore has assumed a political dimension. This is an issue, because suspicions of possible manipulation can arise, particularly in election years. Anyway, while Non Farm payrolls have been in positive territory for the past two years, they are far from being as robust as everyone might like. One measure of this is the manner in which they are anticipated every month, and the relief that the markets exhibit when they contain figures that are well into the positive. So what has all this to do with anything? Just this: We believe that rumours of the end of QE in the US have been exaggerated. We believe that Mr. Bernanke will dampen expectations of the winding down of QE when he testifies in Congress later this week. This will tend to reverse some of the gains that the US currency has had over the last week or so.